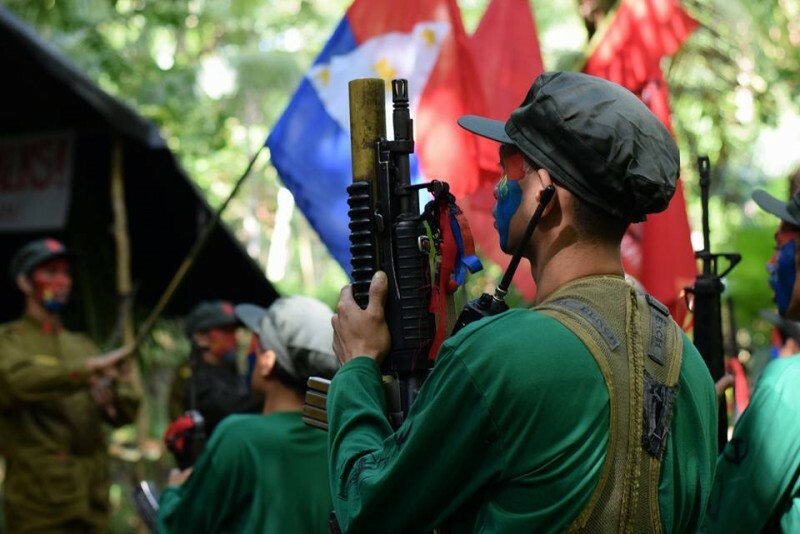 Communist Party of Philippines: Revolutionaries do not seek power sharing | Fight Back! Fighters from the Communist led New People's Army. Fighters from the Communist led New People's Army. Duterte is deliberately engendering the spectre of “power sharing” to scare the ruling elite politicians and get them all behind him in his decision to terminate the NDFP-GRP peace negotiations. At the same time, he discredits the previous GRP presidents for signing previous agreements and not being as astute as him in not seeing the NDFP’s “power sharing” motives. Duterte knows that many among his fellow reactionaries do not sit well with his decision to end the talks. The broad democratic sectors denounce his one-track militarist approach. He also wants to disparage the CPP-NPA “for having the gall” to want to share power with him when the revolutionary forces “could not even control a single barangay for one day” (or so he claims). He aims at Prof. Jose Ma. Sison who he wants to derogate to his level as a power-hungry politician. “I cannot give it to you,” he insists. Indeed, Duterte does not want to share power with the CPP/NPA/NDF. In fact, the dictator wannabe does not want to share power with anyone. He wants it all for himself. To set the record straight, the revolutionary forces do not seek “power sharing” with the GRP. If one closely reads the Comprehensive Agreement on Respect for Human Rights and International Humanitarian Law (CARHRIHL), the only agreement so far which pertains to the substantive agenda of the talks, there is no single mention of “sharing power.” On the contrary, it speaks of “mutuality and reciprocity” as well as “separate duties and responsibilities”, which explicitly indicate two distinct entities. Nowhere in the agreement is it suggested that a coalition government will be established. The same principle of “separate duties and responsibilities” is again stipulated in the NDFP’s draft of the Comprehensive Agreement on Socio-Economic Reforms (CASER). In Part II, Section 3, the NDFP further proposes: “In entering into this agreement, the GRP is guided by its Constitution and the NDFP by the Guide for Establishing the People’s Democratic Government and the Program for a People’s Democratic Revolution of the Communist Party of the Philippines. The revolutionary forces do not seek to share power nor forge a coalition government with the GRP, especially not with Duterte. In peace negotiations, what the revolutionary forces aim to forge is an agreement on measures which the GRP and the NDFP, as separate political entities, will carry out to serve the overall interests of the Filipino people in line with the principles of national sovereignty and social justice. As explicitly stated in the Party’s Program for a People’s Democratic Revolution, the overall aim of the CPP is to build a people’s democratic government (PDG) that would in time be established nationwide and replace the rotten US neocolonial client-state. The PDG represents the workers, peasants, the petty-bourgeoisie and the national capitalists. The broad toiling masses are being roused to wage armed revolution by the worsening forms of oppression and exploitation which they daily suffer. In contrast, the neocolonial state (expressed as the GRP or the Government of the Republic of the Philippines) represents the interests of the US (primarily through its command and control of the AFP), and the reactionary classes of big bourgeois compradors, big landlords and big bureaucrat capitalists (the most parasitic class to which Duterte belongs to). The neocolonial reactionary state is currently the dominant government in the Philippines. The PDG is still comparatively weak, although it is already established nationwide, covering at least 95% of all provinces, with political authority covering a few thousand barrios. Peace negotiations have been going on for more than 25 years now. There are peace negotiations because there are two governments at war with each other. On the one hand, the revolutionary forces behind the PDG are not yet capable of overthrowing the GRP. On the other hand, the GRP has been weakened considerably by the ever worsening crisis of the semicolonial and semifeudal system that it is incapable of pushing back the steady growth of the CPP/NPA, even with the heightening intervention of the US military. Thus is the nature of the civil war in the Philippines. That two armed powers are confronting each other in the battlefield and across the table is the undeniable context behind the long-running NDFP-GRP peace talks. Duterte trivializes the negotiations by claiming the NDFP wants only “power sharing.” No. The NDFP does not covet Duterte’s powers. It seeks, rather, for the two powers, while at war to come to an agreement to address the country’s outstanding problems for the benefit of the people.